Ask for it at a store or library near you! "Not only was it a great laugh, but also an historical learning opportunity. 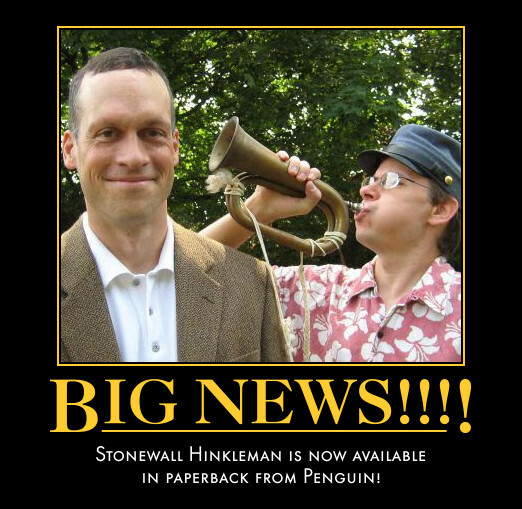 I am not ashamed to admit that Stonewall Hinkleman and the Battle of Bull Run is now one of my favorite books." "Stonewall’s wry first-person narrative will appeal to readers from the start... This engaging novel offers a fresh approach to Civil War fiction." "Kids LOVE Stonewall. They beg me to read daily." 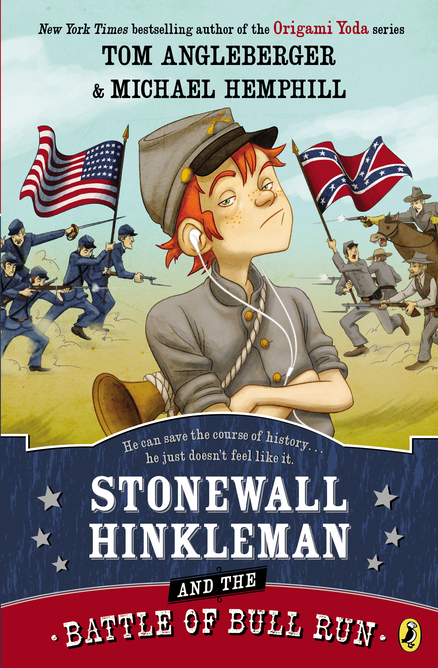 "Stonewall Hinkleman humanizes the Civil War like nothing I’ve ever read." "Combining imaginary and real people and places is succesful and gives readers detailed insight." So this is the webpage about my book, which is all about how I nearly got my head blown off fighting in the real Civil War. If you haven’t read the book, I don’t want to spoil anything for you, but seriously you should read it because it is jampacked with action. Most of it involving people trying to blow my head off! See first of all, there’s this crazy dude who also went back in time and he’s trying to screw up history. And then there’s my crazy great-great-great-great cousin (or something like that) Cyrus who’s a real Civil War soldier and seems perfectly happy to get his head (or worse) blown off and mine, too. And then there’s the real Stonewall Jackson and thousands of other generals and soldiers and cannon shooters on both sides of the war, all of whom seem to be charging right at me and trying to blow my head off. But there is an up side. See, there’s this girl, Ashby, who is amazing and is at least a little bit worried about me possibly getting killed, inlike anyone else. Together, we’ve got to try to survive this crazy day-long battle AND save the world from the crazy dude. Comments Off on Are we having fun yet? NOTE, when this interview was done, Tom was still using the pen name Sam Riddleburger. So he is SR in the interview. A great school visit in Christiansburg, Va.
We had a wild time today at Christiansburg Elementary School. All the fifth-graders from C.E.S. and nearby Belview Elementary were there. About 200 kids in all, the teachers told us. We definitely didn’t have time to count. Those kids were ready to roll! The bugle blowing competition was won by the young lady on the far right, who played Jingle Bells on the bugle! Bull Run Battlefield was a big success! Civil War expert Robert Freis helped us lead a tour of the Bull Run Battlefield, the setting of Stonewall Hinkleman and the Battle of Bull Run. Two days after the actual anniversary of the Civil War’s first major battle, we led a tour of the spot where it happened — and where the events of our book happened. We saw the Henry House, Matthews Hill and, of course, the giant statue of Stonewall Jackson. Our thanks to the park rangers for letting us visit and talk about our book and the real-life history behind it. Afterwards, we headed for the nearby Manassas Library for a more light-hearted program, featuring our infamous Bugle-Blowing Contest. Our thanks to the library for letting us make a little noise. Comments Off on Bull Run Battlefield was a big success!